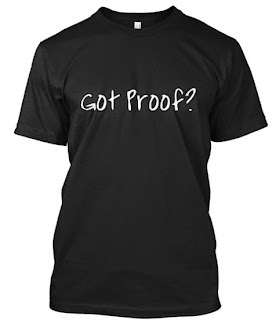 Do you get tired of hearing, "I'm Cherokee but can't prove it"? Make a statement and help Warpony Community Outreach, a Cherokee run charity, at the same time! 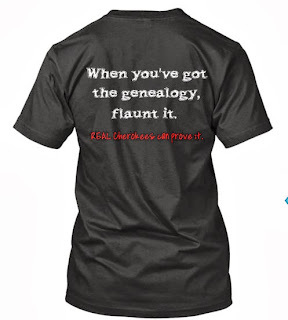 This shirt would be perfect for genealogists; those who work at genealogical archive libraries; registered/enrolled Cherokees; American Indians of other tribes who constantly hear the false claim; and those who want to send a clear message to Senator Elizabeth Warren and others who can't prove what they say about their purported Cherokee ancestry. My goal is to have 100 shirts ordered so the design can be printed. The price is set at $1 over the cost of the shirt, so we can raise $100 for Warpony Community Outreach. Note:Your account will only be charged and this shirt will only print if we reach our goal of 100 pre-ordered. You can pre-order the shirt at this LINK. Sizes run from S - 3X. If you need a different size, contact me for options. The campaign runs from now till June 5th, so don't delay if you would like one of these shirts. Because they are a Limited Edition, this is the only time this particular design will be available. I just ordered two. I'm going to share this with the rest of my family. Thanks, Twila!